Get it, for Aussie's sake! During our 3.5 hour stop over in Amsterdam's Schipol airport (one of my absolute fav's! 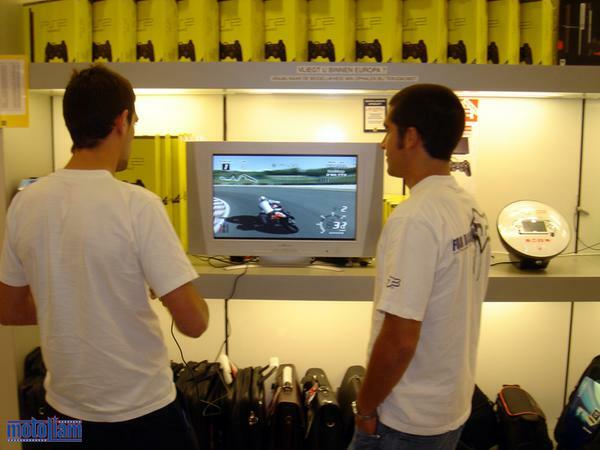 ), three of us mobbed a PS2 display and played Tourist Trophy for at least an hour. It was great, as none of us had any experience with the game, but we pretty much knew all the real tracks and had a funny time trying outrageous bikes and riding styles, competing for top times. I couldn't wrap my head around the physics of the game engine, and I confess that I didn't do very well. Oh well - there's always real life! I want to send some special congratulations to some of my old high school friends who are getting married this weekend and during Sepang's MotoGP race - sorry I couldn't be there in person to share in the glorious ocassion. Congratulations to Hae Young and Dave, Christie and Damon! My heartiest best wishes to you all. I expect to be fairly internet limited in Australia, as the rental house we stay in isn't equipped with the net for all, but I'll likely have some time in the evenings to continue choosing and editing the rest of my Motegi photos. I'm hopeful to run into a couple of old friends in Australia, like my adopted outback family, Matt L, and possibly a few California connections (Hi Andrew and Ducky! ).